Origins came out with the O.G. charcoal mask back about ten years ago that took masking to the next level. This charcoal mask was absolutely essential if you had black heads, clogged pores, or acne prone. If you haven't tried it, don't walk–RUN to Sephora and grab a sample. 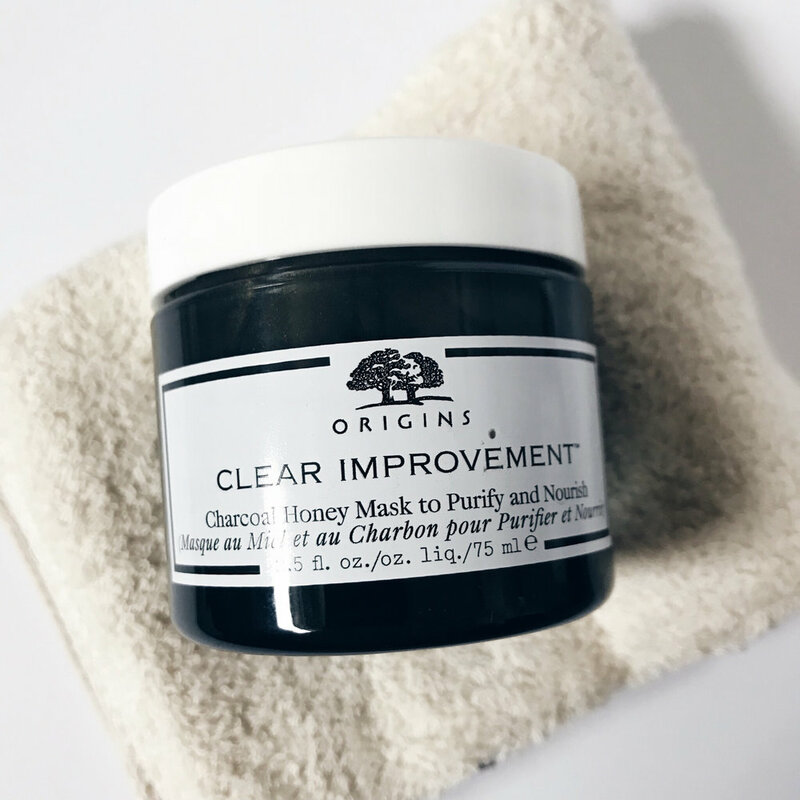 Any-who, just recently this month Origins added another charcoal mask to their line that features the very nourishing ingredient of honey. For all you bee lovers, don't worry, no bees were harmed in making this product. Origins claims that the bamboo charcoal actively draws out pore-clogging impurities and the wildflower/fermented honey help nourish the skin as well as condition it. This product is targeted to those with oily skin/combo/normal/dry skin. That covers a lot of skin types in my opinion. I have to say, lately my skin has been both oily and dry (from recent sunburn), so I had high hopes of liking this product. Once opening this product, I immediately notices how pretty the formula was with micro pigments of gold shimmer. I know the product is brown, which is not so aesthetically pleasing, but adding that extra touch of shine is appreciated. The directions are very vague/simple. Great, a mask shouldn't be so complicated. I applied an even layer to my dry face after taking a hot shower to open my pores and left it on for 15 minutes until it was fully dry. Sometimes as masks dry down, my face starts to itch, I did not experience that with this mask. I rinsed it off in my white sink and rinsed it off. I don't know about you, but I am not so clean when I wash my face. Black water splashed all over my sink/floor. *Tip: apply mask and rinse in shower to avoid a mess all over your sink. :) My skin looked and felt smooth and refreshed. So, of course this formula contains the bamboo charcoal that draws out deep dirt in your pores, but the real highlight ingredient is the fermented honey. If you are acneic, you know that anti-acne products can dry out your skin. This formula would be great for you because while it targets acne causing debris, it also soothes and hydrates with wildflower and honey. I really did enjoy using this mask. I felt like it was easy to use and left my skin very smooth and hydrated. If you are truly just focused on a deep cleanse of your pores, I would still say the original Charcoal Mask from them is better (and its a bit cheaper). Feel free to stop by Sephora and ask for a sample before you buy. I would recommend sephora.com so you can grab a couple free samples with your purchase. I mean who doesn't love free samples? I hope you found this post interesting and fun to read. Leave a comment below letting me know what your go-to mask is!